Costa Cruises, Italy’s largest tourism group and Europe’s no. 1 cruise company, yesterday entered the Guinness World Records for the history-making joint christening of its 13th and 14th additions to the fleet – the Costa Luminosa and the Costa Pacifica. The Costa Luminosa, the ship of light, and the Costa Pacifica, the ship of music, were christened in the port of Genoa: the first time in the world that two cruise liners have been christened at the same time and in the same place. The historic event, certified as a Guinness World Record in the new category “Most ships inaugurated in one day by one company”, involved the whole city in an incredible light and music extravaganza, in keeping with the ships’ personalities and their “Made in Italy” style. As part of the inaugural celebrations, Costa Cruises invited two ambassadors of Italian excellence to be the godmothers of the two exclusive and innovative ships. The Costa Luminosa was named by world and Olympic fencing champion Valentina Vezzali, while the Costa Pacifica was christened by one of the world’s most popular concert and recording artists, Noa, who is a Commander of the Order of the Star for Italian Solidarity for her musical achievement. In keeping with tradition, the two godmothers cut the ribbons and let two bottles of Aneri prosecco wine break against the bows of the ships to symbolize the embarkation. Further highlights included a display of an extraordinary fly-past over the port to the two new ships by the Frecce Tricolori National Aerobatic Team. The performances were followed by a gala dinner for 4,000 guests at the restaurants on the Costa Pacifica. The 100% Italian menu was prepared by two Michelin-star chefs. To further emphasize the inspirational themes of the ships, the evening show, “An Italian Portrait in Music and Light” featured top Italian and international artists, and was a tribute to the creativity, elegance and style synonymous worldwide with the “Made in Italy” label. The Costa Luminosa is the company’s flagship, the most exclusive and innovative of the fleet, designed for ‘high-end’ clientele. Weighing 92,600 dwt, she can carry up to 2,826 guests in 1,130 cabins, 772 of those with private balcony. Her specialty is five innovative guest activities, based on state-of-the-art technology. Known as the five ‘C Wonders’, these include a 4D cinema; the latest generation golf simulator with 37, 18-hole courses and a 100 m² putting green; a Grand Prix simulator; a “PlayStation World”, an area exclusively equipped with PlayStation 3 consoles; and a roller skating track. The Costa Pacifica is the largest Italian cruise liner afloat. 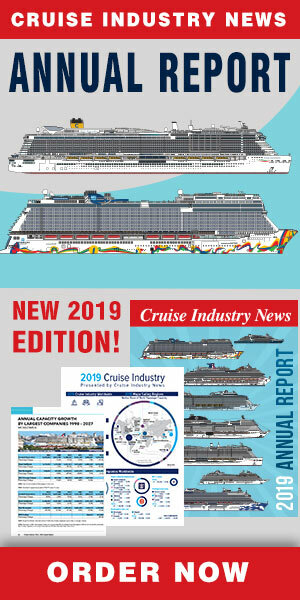 The 114,500 gross-tonnage ship, with guest capacity of 3,780, and 1,504 cabins, also features the Grand Prix simulator and the “PlayStation World”. As the ship of music, she is the world’s first vessel with a real recording studio fitted out with the most sophisticated equipment for guests to record their own CDs. For pampering, both ships house a large Samsara Spa wellness centre, which features the premier Technogym Kinesis circuit, and a central swimming pool with a retractable glass roof and a mega-screen.